Go behind the scenes with the research team as they tag whale sharks in the Philippines. The Philippines is an important hotspot for whale sharks and globally hosts the third largest known population of whale sharks (www.whaleshark.org). While the species has been protected in the Philippines since 1998, globally the species was uplisted in 2016 to ‘endangered to extinction’ in the IUCN Red List of Threatened Species due to a population decline of more than 50%, largely caused by continued exploitation in the Indo-Pacific. Particularly in South East Asia, concerns remain due to continued fishing in regional waters; understanding the movements of whale sharks in the Philippines is vital if we are to identify conservation priorities for the species. In this study, 17 individual whale sharks were tagged with Wildlife Computers SPOT5 satellite tags in three different locations in the Philippines: Panaon Island (Southern Leyte), northern Mindanao (Misamis Oriental and Surigao del Norte) and Tubbataha Reefs Natural Park (Palawan). Tagging took place between April 2015 and April 2016. All tagged whale sharks were juveniles, ranging in size between 4.5 – 7 meters and 73% of them were male. By attaching SPOT5 satellite tags to the sharks, the team was able to follow the movements of juvenile whale sharks in near real-time. The tags work by communicating with passing ARGOS satellites, transmitting a location when the wet/dry sensor is triggered when a tagged whale shark breaks the surface. To aid transmission tags were tethered to a whale shark by a 1.8-meter line to ensure the tags broke the surface more frequently. The team tag a whale shark, surrounded by barracuda in Tubbataha Reefs Natural Park (TRNP). Tracks from the tags revealed that all whale sharks stayed within the Philippines over the tracking period, emphasising the importance of the archipelago for the species. 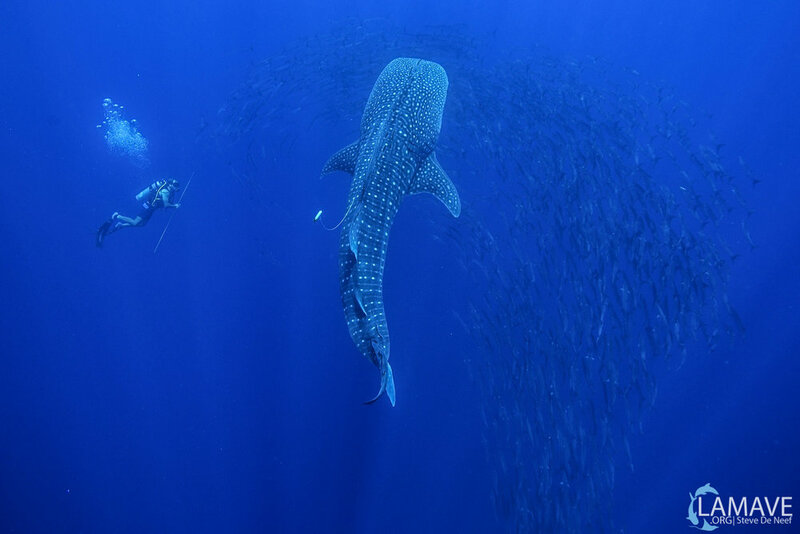 The longest track observed was from a whale shark originally tagged in Tubbataha Reefs Natural Park, which appeared to swim through the Sulu and Bohol Seas and into the Pacific, a journey accumulating over 2,500 km in length. While whale sharks are not known for their speed, results revealed that one individual whale shark was averaging 47km a day, further emphasising the species’ mobile tendencies. Satellite tracks of whale sharks tagged in Southern Leyte and Mindanao, Philippines. Satellite tracks of whale sharks tagged in TRNP. Dedicated research by LAMAVE and citizen science has identified over 600 individuals in the Sulu and Bohol Seas, yet the proximity of this population to fisheries in the broader region (South China Sea) means it is vital to monitor this population as a whole to understand if this population is in recovery or continuing to decline. Identifying threats and mitigation strategies is a conservation priority for the species. LAMAVE continues to study whale sharks in five key areas in the Philippines, working with local and national governments as well as collaborating organisations to develop conservation strategies for this iconic species. Gonzalo Araujo and the team encounter a whale shark on scuba in Tubbataha Reefs Natural Park. A copy of this press release is available for download HERE. If you would like more information about this topic, please contact Sally Snow at s.snow[at]lamave.org. Photos and video are available upon request.